(Phys.org)—A team of researchers with George Fox University in Oregon and the University of Montana has uncovered the ways in which calliope hummingbirds (Selasphorus calliope) get rid of the large amount of heat that is generated as they rapidly beat their wings. In their paper published in the journal Royal Society Open Science, the team describes their experiments and results and why they believe what they found could be problematic for the birds in the coming years. When we walk fast, run or engage in other exercise, our muscles burn a lot of calories which results in the generation of heat—our bodes respond by sweating—the evaporation of the liquid helps cool us down. Birds, on the other hand, do not sweat and they are covered in feathers, two factors that would seem to make it difficult for them to keep cool during times when they are flying. Also, because they flap faster than other birds (up to 50 times a second) hummingbirds would seem to have a serious challenge in removing the heat their muscles generate. To find out how they do it, the researchers put several specimens in a wind tunnel and filmed them with an infrared camera the results of which displayed different colors on the birds' bodies representing different temperatures. In studying the video, the researchers found that the birds tended to dissipate heat from their feet, in the areas where their wings met their bodies and around their eyes. They found that such areas showed temperature differences up to 8°C warmer than the rest of their bodies. They noted also that the heat dissipating became more noticeable as the birds reduced their flight speed and was most pronounced when the birds were hovering (they are the only birds that can do so)—they noted also that the birds lowered their feet more during these times, which allowed more heat to dissipate. Heat dissipation is critical for the birds, the team notes, and thus it appears likely they change their behavior when it is hot outside. This, they note, could spell trouble for the birds in the years ahead as the planet warms. Flying animals generate large amounts of heat, which must be dissipated to avoid overheating. In birds, heat dissipation is complicated by feathers, which cover most body surfaces and retard heat loss. To understand how birds manage heat budgets during flight, it is critical to know how heat moves from the skin to the external environment. Hummingbirds are instructive because they fly at speeds from 0 to more than 12 m s−1, during which they transit from radiative to convective heat loss. 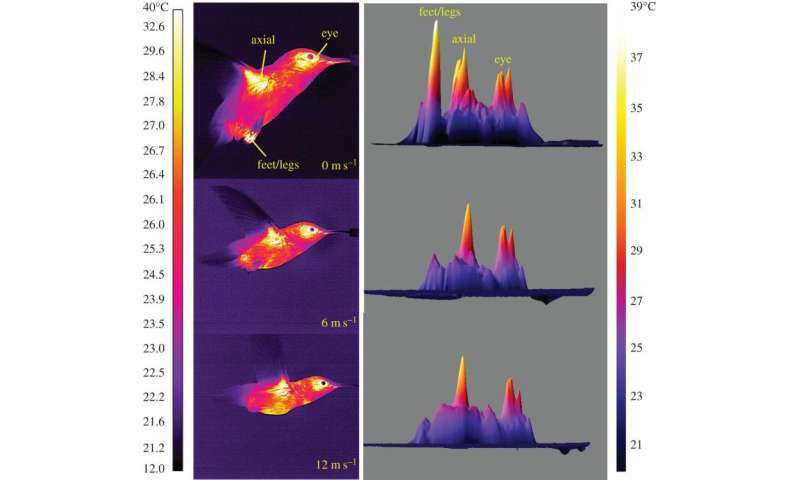 We used infrared thermography and particle image velocimetry to test the effects of flight speed on heat loss from specific body regions in flying calliope hummingbirds (Selasphorus calliope). We measured heat flux in a carcass with and without plumage to test the effectiveness of the insulation layer. In flying hummingbirds, the highest thermal gradients occurred in key heat dissipation areas (HDAs) around the eyes, axial region and feet. Eye and axial surface temperatures were 8°C or more above air temperature, and remained relatively constant across speeds suggesting physiological regulation of skin surface temperature. During hovering, birds dangled their feet, which enhanced radiative heat loss. In addition, during hovering, near-body induced airflows from the wings were low except around the feet (approx. 2.5 m s−1), which probably enhanced convective heat loss. Axial HDA and maximum surface temperature exhibited a shallow U-shaped pattern across speeds, revealing a localized relationship with power production in flight in the HDA closest to the primary flight muscles. We conclude that hummingbirds actively alter routes of heat dissipation as a function of flight speed.